The HS2 is the handheld display for the new Hydrosense II soil-water sensor. 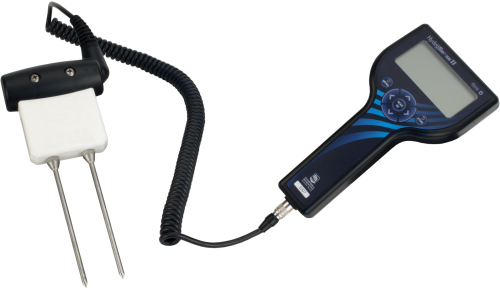 When paired with either the CS658 or CS659 portable soil-water probes, it replaces the previous Hydrosense soil-water system. It features a new handheld display and a new probe design. The HS2 handheld has been designed to be compact and portable, with the layout of the buttons allowing for operation with one hand. The new soil moisture probe uses the same accurate measurement technique as the old probe, but the probe housing has been redesigned to aid insertion into and removal from hard soils. The probe rods are secured to the probe housing with ferrule nuts to provide extra stability during insertion. A molded plastic grip connects the sensor cable to housing to provide better grip. New PC software has been developed to make the most of the data storage capability of the HS2. The software connects to the HS2 via Bluetooth to avoid the need for extra cables. Required Equipment HS2 is a complete system. -NOTE- The CS659 and CS658 cannot share rods. The HS2 is the display used in the Hydrosense II System. The water content sensor is ordered as an option, and may also be purchased separately. Either the CS658 or CS659 can be used with the HS2. The CS658 has 20-cm rods, and the CS659 has 12-cm rods. Note: The CS658 and CS659 cannot share rods (i.e., 12-cm rods cannot be used with the CS658, and 20-cm rods cannot be used with the CS659). Is it possible to import HydroSense data into the HS2 HydroSoft Software? No. The original HydroSense was not capable of storing data. The HS2 produces a CSV file that can be merged into an existing data file used for HydroSense data. However, the CSV output file from the HS2 will include additional parameters that were not measured by the original HydroSense. Does the HS2 work with a cabled USB interface for data download? No. The HS2 uses Bluetooth communication. What is the pairing code for the HS2? As stated in the "Connecting via Bluetooth" subsection in the "Data Storage and Retrieval" section of the HS2 Instruction Manual: “The first time the HydroSense II unit is used with a new computer, the computer and HydroSense II must be ‘paired’ before a connection can be made. The pairing code is ‘1234.’” For more information, see the "Connect to a Device" subsection of the "Quickstart" section of the HydroSense II Support Software User Guide. Can the 20 cm rods from a CS620 be used with a CS658? No. The 20 cm rods (pn 18592 or pn 12007) from a CS620 cannot be used with a CS658. The CS658 uses different 20 cm rods (pn 26485 or pn 26483). Are replacement parts or services available for the retired HydroSense? Can the 12 cm rods from a CS620 be used with a CS659? Yes. The 12 cm rods (pn 18591 or pn 10184) can be used. What would cause an HS2 to display a negative RWC (relative water content) reading? When Deficit Mode is used, a negative RWC value indicates that the water content is below the dry reference. For more information, see the "Water Deficit Data" subsection in the "Operation" section of the HS2 Instruction Manual. Is a Bluetooth connection the only way to download the onboard data records from the HS2? Yes. See the "Connecting via Bluetooth" subsection in the "Data Storage and Retrieval" section of the HS2 Instruction Manual. Is it necessary to use the 28411 Bluetooth 2.1 USB Micro Adapter with the HS2? If the computer being used is Bluetooth enabled, an adapter is not needed. If the computer being used is not Bluetooth enabled, an adapter can be purchased (HS2-BTD, Bluetooth 2.1 USB Micro Adapater). How is the HS2 powered? Four AA batteries power the HS2. The batteries are user replaceable.